Throughout this series, we have discussed deep networks by examining prototypical instances of these models, e.g., deep feed-forward networks, deep auto-encoders, deep generative models, but have not yet interrogated the key word we have been using. We have not posed the question what does 'deep' mean, and what makes a model deep. There is little in way of a detailed discussion as to what constitutes a 'deep' model and can be hard to do — it seems appropriate as a closing attempt to provide one such view. Arguably, deep learning today means much more than a description of a class of useful models. It espouses the use of powerful non-linear models, models that provide unified loss functions that allow for end-to-end training, machine learning approaches designed from the beginning to be scalable and amenable to large data sets, and to computational methods that fully exploit modern computing resources. While these other factors have been most remarkably demonstrated with deep learning, these are goals shared with all other areas of machine learning. What is of central importance is 'deep' as a characterisation of models and their desirable features. Deep and Hierarchical models are abound in machine learning. If we look into the existing literature, deep learning is generally described as the machine learning of deep models. And a deep model is any model that involves multiple levels of computation, in particular, computation achieved by the repeated application of non-linear transformations  . This is a general framework and the number of transformations used forms the depth of the model. This is well-suited as a description of neural networks (or recursive GLMs), since we can easily construct a model by recursively applying a linear transformation followed by an element-wise non-linearity, allowing us to move from linear regression models that use only one (non-)linear transformation (so called 'shallow' models) to more complex non-linear regressions that use three or more non-linear transformations (i.e. 'deep' models). At layer l, the inputs from the previous layer are transformed using a linear mapping into natural parameters of the Bernoulli distribution (into the pre-synaptic activations). Since we perform maximum likelihood estimation in the canonical or mean parameters of this model, there is an implicit transformation of the natural parameters using a sigmoid function — a link function for the Bernoulli distribution. 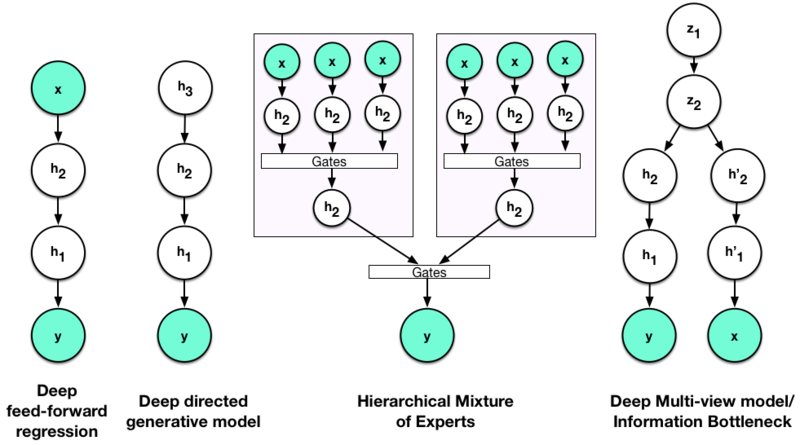 Non-linear Gaussian belief networks (NLGBNs) follow the same hierarchy as SBNs, but use Gaussian latent variables, and form the hierarchy through the Gaussian means. And is closely related to hierarchical ICA. Deep Latent Gaussian Models (DLGMs) and Deep Auto-regressive Networks (DARN) form their hierarchy through the means of Gaussian and auto-regressive Bernoulli distributions, respectively. Deep Gaussian Processes, a non-parametric analog of the NLGBNs, are formed through a hierarchical dependency through its mean functions. Deep Exponential Families (DEF), similar to the description above for deep feed-forward networks, construct a hierarchical model using one-parameter exponential families. This single (canonical) parameter controls all moments of the distribution and often directly encodes the mean, so any hierarchy formed in this way is a hierarchical model of the means. Deep Boltzmann Machines (DBM) are graphical undirected models (i.e. all conditional probabilities and restrictions are fully specified by its graphical depiction) also form hierarchical log-linear models using one-parameter exponential families. The intuition we obtain from deep learning is that every stage of computation, every non-linear transformation, allows us to form increasingly abstract representations of the data. Statistically, every hidden layer allows us to capture more long-range and higher order correlations in the data (after being integrated out). In either view, these hierarchies are important since they provide a highly efficient way to construct complex models, e.g., in a mixture model we can use a 2-layer hierarchy using K and L clusters at each layer, effectively modelling clusters — something infeasible with a standard (flat) mixture model. Parts of our hierarchy far away from the data are indeed more abstract (diffuse and close to the prior), since they have a small effect on the data distribution: this implies that to effectively learn with and use deep models, we require large amounts of data. Deep models forming their hierarchies through the mean parameters are amongst the most powerful and flexible models in the machine learning toolbox. If you are going to build any hierarchical model, a hierarchy through the mean is a very good idea indeed. There are two aspects that follow from this: firstly, there are many models that are formed through mean-hierarchies that are not labelled as deep; secondly, a hierarchy through the mean represents just one way to build such a hierarchical model. Hierarchies on variances: this is a natural step and is used in many Bayesian models where learning variances is involved. This does raise interesting research questions as to what assumptions and distributions to use beyond the simple one-parameter exponential families that are widely used. Hierarchical mixture models, mixed-membership models and admixture models: These models form a mixture of mixture-models. These are not typically called deep, though they could be called that. As mentioned above, we can easily can represent mixture components using such constructions. They show how different representations can be combined in useful ways, e.g., if the mixture is over deep feed-forward networks. Bayesian networks and multi-level regression models. As Wray Buntine points out (see comment below) these are also hierarchical models of the mean, and points to another aspect that has not been discussed: that of distributed representations. Deep learning emphasises distributed representations (using multivariate continuous latent variables), and models such as the HDP show how both distributed and partitioned representations can be used together to provide powerful and adaptive models. Canonical Correlation, Information Bottleneck and multi-view models. One way to characterise models described as deep are as hierarchical models of means: hierarchical models where the mean at every layer of the hierarchy depends on computation in previous parts of the hierarchy. This is a correspondence we find in almost all models characterised as deep in our current practice, whether these be deep neural networks, deep latent Gaussian models, deep exponential families or deep Gaussian processes. This is always our first approach in building modern machine learning models, since we can capture a great deal of the structure underlying our data in this way. But we also know how to extend our hierarchies in ways that allow us to specify other structural aspects we may be interested in. While it is conceptually easy to extend our hierarchies in many ways, techniques for dealing with hierarchies other than the mean in computationally efficient ways are still missing, and remains one of the important research questions that we face in machine learning. This forms last post I've planned in this series and plan to post a brief summary of the set as a follow-up. Plans and thoughts are underfoot for a new set of musings (in reinforcement learning or neuroscience). Technically, hierarchical Dirichlet processes and hierarchical Pitman-Yor processes are also hierarchies of the mean. They also have fast algorithms which *some* of us use, and *some* have parallelised. "While it is conceptually easy to extend our hierarchies in many ways, techniques for dealing with hierarchies other than the mean in computationally efficient ways are still missing"